John ("Jason") Martin holds a Ph.D. in French and comparative literature and has taught at Michigan Tech, the University of Tulsa, and West Virginia University. Being involved in Amazonian shamanism for more than twenty years, Jason has in-depth knowledge of the two worlds in which his most recent work, Voluptua, is set. A seasoned traveler, he has lived in France, Greece, and Spain, and has traveled widely in India, Mexico, and Peru. He speaks fluent French, modern Greek, and passable Spanish. He worked in France as a Seine River boat pilot and was married by his shaman in the Temple of the Stars in Machu Picchu. Jason has been a teacher of yoga and meditation for more than thirty years and is the co-founder of the Starseed Center for Yoga and Healing in Montclair, New Jersey. He maintains a healing practice in Montclair, New Jersey (www.jasonmartin.mirrorz.com). He was a founding member of the Twelve Miles West Theater, an equity company that produced several of his plays. He has also published The Atlantic Monthly and is the author of the 1983 work, "The Golden Age of French Cinema, 1929-1939" (Twayne's Filmmakers Series). 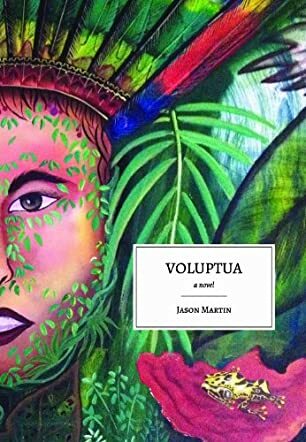 Voluptua: A Novel by Jason Martin is a story set against the backdrop of Amazonian shamanism. Ellen gives up her university career to explore the world of shamanism. She meets a Peruvian stranger, Hugo, who is also into shamanism. He changes the series of events in her life by providing an unexpected twist. Ellen goes to the Amazon in search of Voluptua, a forest spirit who has been calling her in her dreams. Ellen meeting Voluptua takes the story to another level. The Amazon jungle, spiritualism, and the forest spirit make the book enchanting. I was always fascinated by shamanism and this book takes you through the interesting details of shamanism and the exotic Amazon jungle. The theme of the book is compelling and captivating. The author explores the Amazon and shamanism, and weaves them along with emotions and human interests, creating a beautiful story. The book, with its spiritual angle, is also very uplifting for readers who are keen to read about shamanism. Voluptua is educational, too, because you learn many new things about the Amazon, shamanism, and also Peruvian shamanism. On the whole, it is a very entertaining story. The description of the Amazon rain forest is vivid and compelling and adds to the visual aspect of the book. Although Voluptua is this author's first novel, it is one of the most engaging, evocative and compelling novels of its kind that I have read. The author is a master wordsmith, an artist who not only paints, but sculpts with words, and whose focus is exploring humankind's relationship with itself, with the world of nature that surrounds and embraces it, and with the world of the spirits only dimly glimpsed out of the corners of our eyes if at all by most of us. Jason Martin creates a new (or at least reveals a previously hidden and undiscovered) world and a new vision of human possibilities and potential futures that are unsurpassed in their vividness. His textured plot, his deep character development, and his dry, irreverent sense of humor pervade the book making its reading a pleasure and its completion a reason to yearn for more from this author. Voluptua opens at a fictitious American college, Wellington University, an institution of higher learning (or so it claims) packed with all of the venality, self-absorption and mindless punctilio that characterize tertiary education at the opening of the twenty-first century. Anyone who, like the author, has spent time in academia will recognize the mad, sad, driven and dangerous characters they have encountered. The book's protagonist, Ellen Metran, is a thirty-ish professor of literature who gives up a promising university career at the behest of a friend steeped in Amazonian shamanism to immerse herself in that world, fulfilling her highest potential and life's ultimate purpose in a way wholly outside of her experience and alien to her upbringing, culture and education (as well as to the reader's expectations). As the adventure unfolds, one finds oneself unable to put the book down.